Instead of non-PoE switch, the PoE switch is more commonly used to build the wireless network. Well, what are PoE switch and non-PoE switch? What is the difference between PoE switch vs non-PoE switch? Which one to choose? In this article, we will share some insights and help solve the above questions. PoE Switch vs Non-PoE Switch: What Are They? To understand the PoE switch, we’d better know Power over Ethernet first. PoE is a revolutionary technology that allows network cable to provide both data and power for the PoE-enabled devices. The PoE can provide higher power and reduce a lot of power cables during network. Usually, it is used for VoIP phones, network cameras, and some wireless access points. PoE switch is a networking device with PoE passthrough which has multiple Ethernet ports to connect network segments. It not only transmits network data but also supplies power via a length of Ethernet network cable, like Cat5 or Cat6. The types of hubs can be classified into 8/12/24/48 port Gigabit PoE switch, or unmanaged and managed PoE network switch. Among the various port designs, the 8 port PoE switch is considered as a decent option for home network and 24 port PoE switch is popular for the business network. Non-PoE switch, just as the name, is the normal switch, which can only send data to network devices. There is no PoE in the normal switch to supply electrical power for end users over Ethernet. PoE Switch vs Non-PoE Switch: What’s the Difference? The biggest difference between PoE switch and non-PoE switch is the PoE accessibility. As mentioned above, the PoE switch is PoE enabled while the non-PoE switch is not PoE enabled. For PoE switch, you can mix PoE and non-PoE devices on the same one. Because if there is no need to use power, you can turn off the PoE of the PoE switch and use it as a regular witch. However, non-PoE switch can’t support the mixing of PoE and non-PoE devices. For non-PoE switch, it can be PoE ready only by installing a PoE injector to power a few devices. The injector is able to add electrical power and then transmits both data and power to power devices simultaneously. Users require one extra cable to connect power outlets. In this solution, if a PoE injector goes out, it only affects one device. But if the PoE goes out in a PoE switch, all PoE devices will be down. Many users may encounter this problem. Should we choose PoE switch or non-PoE switch? 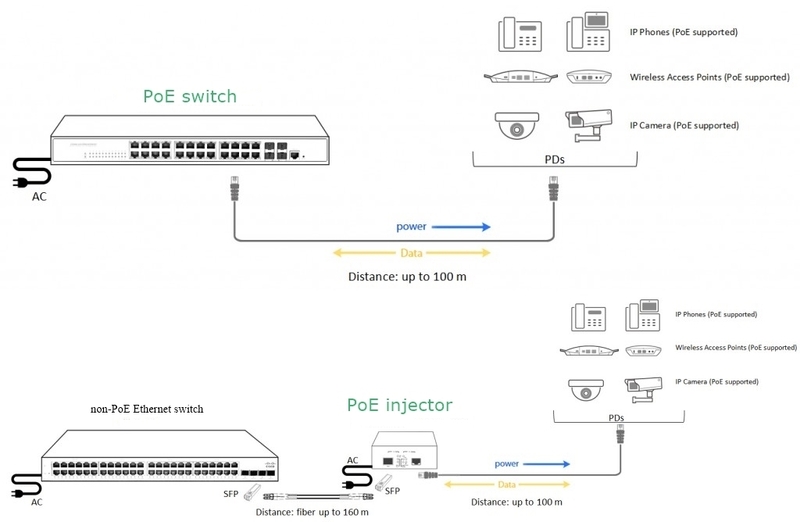 Though the non-PoE network switch can also acquire PoE by installing injector. But PoE switch has some advantages over the non-PoE switch. Flexibility – The PoE switch is powered through existing PoE network infrastructure and eliminates the demand for additional electrical wiring. This gives you flexibility to employ the switch wherever you need. Good performance – PoE switch is designed with advanced features like high-performance hardware and software, auto-sensing PoE compatibility, strong network security and environmental adaptability. It provides better performance for users. Cost-efficient – There is no need for users to purchase and deploy additional electrical wires and outlets with PoE switch. Therefore, it makes great savings on installation and maintenance costs. 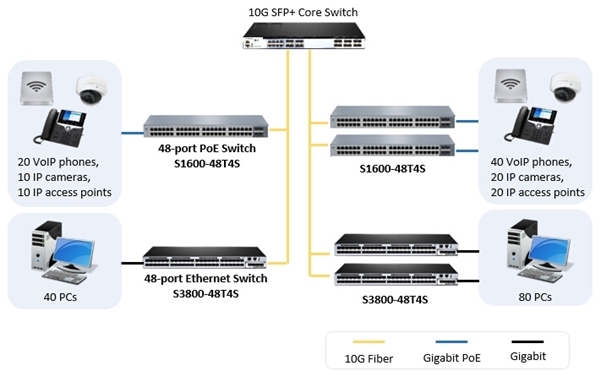 After the comparison of PoE switch vs non-PoE switch, do you know which one to choose? Actually, it depends on your real needs. 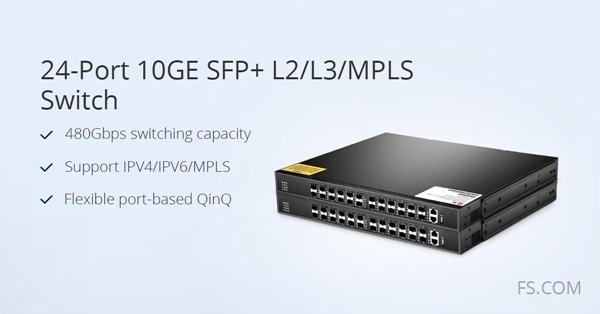 FS is a good place to go for the reliable and cheap PoE or non-PoE network switch. Welcome to contact us if you have any needs about it. Related Article: 24 Port Managed PoE Switch: How Can We Benefit From It? Network Switch Before or After Router? Network switch and router are the commonly used devices in a network. With each carrying out its own duties accordingly, you can surf on the internet freely with your smart phone or computer. How to setup a network switch and router? Should the network switch be installed before router or after router is puzzling for many network newbies. 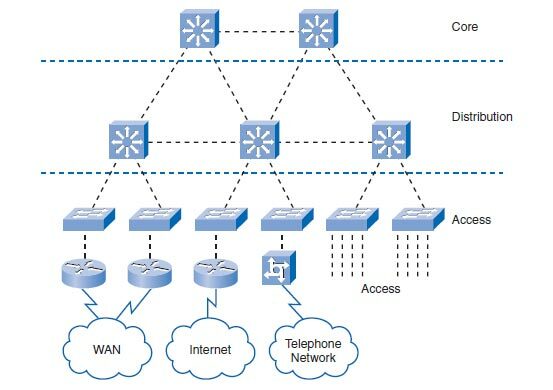 What Is Network Switch and Router? To get clear about how to connect wireless router to switch, this part will state the function of network switch and router first. What is a switch in networking? A network switch is used to connect multiple devices such as computers, printers, IP camera and modem on the same network within a building. In this way, these devices can share information and communicate with each other. What is a router in networking? A router is sometimes connected to a modem at one side and many other devices on the other side. Because the modem will only talk to the first computer that talks to it, the router at the position serves like a dispatcher to share the connection among all your devices. This enables all connected computers to share one single Internet connection. How to Setup a Network Switch and Router? From the above introduction, we know that both the network switch and the router can be connected directly to a modem. However, when the two devices coexist, how to deploy them. Shall I connect modem to router to switch or modem to switch to router? In most cases, you will see people put the modem first, followed by a router and then a gigabit Ethernet switch. 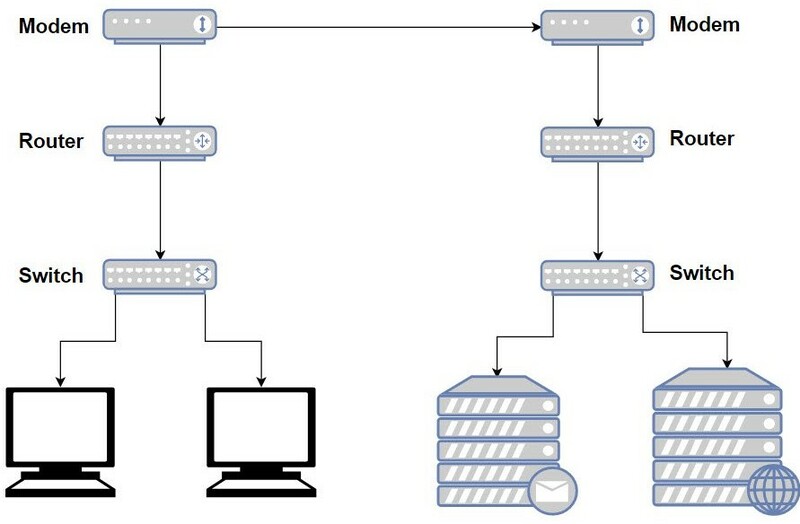 The principle is that the modem gives the public IP address to the router, and the router assigns the private addresses to the devices connected to it, while the network switch doesn’t handle allocating IP addresses but serves as the extension of the limited ports on the router, to receive more devices. In this scenario, all your devices with private addresses are safe as they are not directly visible to the internet. Some people propose going from a cable modem to switch to wireless router. This seems good because all your devices on the network switch will have direct connections to your ISP. However, the truth is, your ISP does not offer multiple public IP addresses before the full transition from IPv4 to IPv6. So one or all ISP connections will likely fail and all of the devices connected to the switch would be exposed to the internet. In a word, placing a modem to switch to router is not possible. At least not practically. Each port on the switch is a different IP address. So it doesn’t exist? Probably not unless your modem integrates the function of a router so that you can rewire and reconfigure the wireless router to set it up as access point. Seen from the outside, you indeed put a managed switch before router, however it still follows the principle that router goes before network switch. Network switch before router or after router? Have you made it clear? This post has stated modem to router to switch vs modem to switch to router. Hope when you set up your network with router and switch, you can put them in the correct order according to your needs and the products themselves (the modem type). 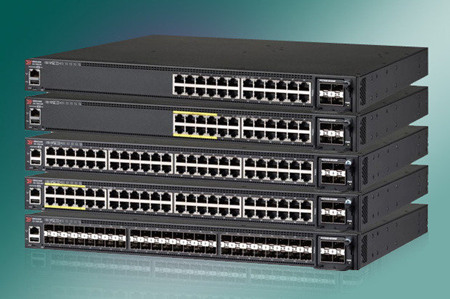 Here at FS.COM you can find various network switches including 10 gigabit switch, 40 gigabit switch and 100 gigabit switch, etc. 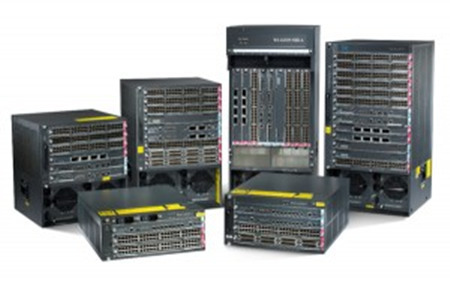 As a worldwide leader in IT and fiber optical networking, Cisco switches play a leading role in manufacturing network switches and in providing switching solutions for data center and enterprise networks with large and medium-size forms. MikroTik, a Latvian company which was founded in 1996 to develop routers and wireless ISP systems. Their cloud switches are highly favored by many Ethernet users in recent years. And thus, people are entangled with Cisco and Mikrotik switches. This article would give brief introduction to Cisco and Mikrotik switches, and put emphasis on Mikrotik Switches Vs Cisco Switches. According to different usage, Cisco divided their switches into the following categories: LAN Access Switches, LAN Digital Building Switches, LAN Core and Distribution Switches, Data Center Switches, Service Provider Switches, Industrial Ethernet Switches, Virtual Networking and Small Business Switches. And every category has its switching series. The Cisco Catalyst series switch delivers ease of management and configuration for small to medium-sized enterprise wiring closets in a single system, without the need for additional modules. The following list is about the Cisco Catalyst series switch. The CPU on both Cisco and Mikrotik switches is used for management purposes (snmp stats, cli management, etc) and it does not affect the data path. Switching is not done in CPU, neither on Cisco nor on Mikrotik. Switching is done on dedicated ASIC chips specifically designed for this job (thus giving wirespeed). So comparing the CPUs won’t mean much about forwarding performance – which is the metric you should care about. One of big problems with Mikrotik switches is their power. The buyers would prefer to pay another couple hundred dollars to have dual power supplies that are removable. And thus, many Ethernet users cannot use Mikrotik in these cases. Comparing to Mikrotik switches, Cisco switches have less power consumption by their advanced technology. Most network monitoring software systems natively understand, support and auto-detect Cisco devices and support Cisco SNMP OIDs (CPU, temp, load, bandwidth, errors, power supply status, and many other sub-system counters in a Cisco device. When configuring your existing network monitor system(s), your network monitor system(s) may not even know what a Mikrotik is and probably does not have native built-in MIBs/OIDs used by SNMP to auto-check/monitor a network. Thus, an administrator would probably need to configure the Mikrotik graphic icons and configure all of the SNMP checks for MIBs/OIDs from/to a Mikrotik. Mikrotik Switches Vs Cisco Switches: How to Select? Mikrotik routers and switches are great. Most people like them and use them almost everywhere. 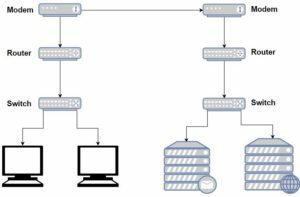 However, because Mikrotik is still the new kid on the block when it comes to carrier-grade commercial-grade business grade high-throughput products, it may sometimes be a little difficult to find local network technicians or local phone support for Mikrotik products when adding new equipment into your network. So Cisco switch is more solid and people are more satisfied with them. As a new emerging technology, 100G is some sort of evolution and part of revolution. The new CFP (C form-factor pluggable) optics is now a revolutionary step as one form factor of 100G optic transceiver. The CFP modules offer the enabling step for cost-effective and successful 100G deployment. So what is it? And how does it work in 100G network? This article would give a comprehensive introduction to CFP module. Abbreviated as CFP module, C Form-Factor Pluggable transceiver is a multi-sourced pluggable transceiver used in the transmission of high-speed digital signals. It is specified by a multi-source agreement (MSA) between competing manufacturers. The c stands for the Latin letter C used to express the number 100 (centum), since the standard was primarily developed for 100 Gigabit Ethernet systems. It is a hot-swappable input/output transceiver that is used in the data communication and telecommunication networks. – Support to 103 Gbps and 112 Gbps aggregate bit rates. One distinctive feature of CFP modules is that they support digital diagnostic monitoring functions or the digital optical monitoring. This is the feature that gives users the ability to monitor the real-time parameters such as the optical output power, the optical input power, the temperature, the laser bias current and the transceiver supply voltage. The basic CFP modules consist of the following parts. 1. An Integrated Coherent Optics Transmitter which sends the TX optical signal. 2. An Integrated Coherent Optics Receiver which receives the RX optical signals. Most of the CFP module adhere OIF CFP-ACO (Analog Coherent Signals) and are connectable to multiple DSP’s. The biggest engineering challenge that CFP2 faces is the adoption of the high-speed 25 Gbps electrical interface due to the reason that the CFP was based on the third generation. It can be a multimode parallel optic transceiver module that is designed to offer high-density 100G Ethernet and Optical Transport Network (OTN). The device is designed to offer maximization of the delivery of the 10G data channels for the 100G networks that support 100 Gbps SR10 and 10 X 10 Gbps. The original CFP specification was proposed at a time when 10 Gbit/s signals were far more achievable than 25 Gbit/s signals. As such to achieve 100 Gbit/s line rate, the most affordable solution was based on 10 lanes of 10 Gbit/s. However, as expected, improvements in technology has allowed higher performance and higher density. Hence the development of the CFP2 and CFP4 specifications. While electrical similar, they specify a form-factor of 1/2 and 1/4 respectively in size of the original specification. 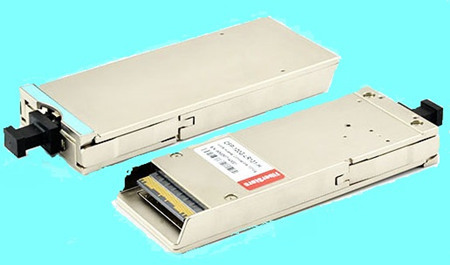 Note that CFP, CFP2 and CFP4 optical transceiver are not interchangeable (but would be inter-operable at the optical interface with appropriate connectors). The following table shows the basic parameter of CFP, CFP2 and CFP4 transceivers. In this article, we mainly introduced the definition, core features, inner structure and development of CFP modules. Comparing to 100G QSFP28 transceiver, CFP price is not so competitive. But CFP optical transceiver is still the key to cost-effective and reliable 100G deployment, and it has been widely deployed in OTU4 411-9D1F, 100GBASE-LR4 Ethernet and data centers. Why Use Media Converters in LAN & MAN? Nowadays, people are widely using media converters for LAN (Local Area Networks) and MAN (Metro Area Network). As for the LAN, media converter plays an important role in combining the fiber optic cabling and active equipment with the current copper structured cabling. And in the case of MAN, media converter is also significant in conversing electrical signals into optical signals which increases the service deployment and decreases the service cost for customers. This post is going to further explain the advantages of using media converters in LAN and MAN respectively. At first, media converters are simple devices just used to connect two dissimilar media types such as twisted pair with fiber optic cabling. Today, category of media converters increases a lot. And the function of media converter is not single and can meet more requirements. Media converters including fiber to RJ45 converters, SFP Ethernet converters, OEO converters, mode converters, fiber video converters, etc. can be found in the market. Now some LAN is still structured with twisted pair wiring. As a result, the transmission distance is greatly limited with only 100 meters. To extend the data transmission distance, fiber cable gains the popularity since it can support longer transmission distance and it’s more and more inexpensive. But in practice, copper is familiar and easier to be installed. Besides, many network devices still have copper ports. It would cost too much to replace all the expensive equipment with fiber optics. So media converter is applied to realize the copper & fiber conversion with the cheapest price. Media converters make it possible to migrate a local network to fiber while maintaining the existing infrastructure. When connecting legacy 10BASE-T network segments to a newer 100BASE-FX Fast Ethernet infrastructure, media converter is the best solution. With one RJ45 port and one SFP socket, this 10/100Base-T to 100base-X SFP Ethernet fiber media converter can mediate between 10/100M UTP ports and 100M optical fiber ports. And it can reduce electromagnetic interference and extend the distance up to 100 km. Media converters can support network speeds from 10 Mbps to 10 Gbps. Media converters are also used to expand the reach of the LAN to cover more locations. A converter can connect multiple LANs to form one large “campus area network” that spans over a limited geographic area. As premises networks are primarily copper-based, media converters can connect two distance switches with single-mode fiber and extend the reach of the LAN up to 130 km. Existing data rate in the LAN backbone at 100Mbps or Gigabit speeds, fiber can accommodate high-bandwidth applications such as streaming media and voice over IP for more secure desktop connections. Media converters can make FTTD (fiber to the desktop) cost-effective in the LAN. With media converters, the cost of expensive fiber home which requires all-fiber switches, patch panels and network interface cards can be saved by converting in the telecommunications room and at the desktop. Figure 3. Media Converters Make FTTD a Reality. Ethernet is the dominate LAN protocol with the highest market penetration. Past 10/100Mbps connections in LAN can’t meet the demands for high-speed data traffic. With the publication of the 10, 40 and 100 Gigabit Ethernet standard, the applications space for Ethernet expands from the LAN to MAN. Media converters are deployed in the MAN to provide the physical layer connection and to bridge the bandwidth gap that exists between LAN and MAN. In the LAN, the structured cabling is often twisted-pair copper cable or multi-mode fiber. While the cabling is often single-mode fiber in the MAN. So media converters are used at both ends of the first mile to provide the electrical-to-optical conversion from the POP (point of presence) switching router to single-mode fiber, and back to 10/100/1000BASE-T Ethernet at the customer premises. At the same time, if the customer needs to increase the internet speed, the bit rate can be increased through the POP switch and the converter will automatically adapt to the increased speed, avoiding a visit to the customer site or POP. Media converters can realize the connections between copper switch ports and optical access to get more flexible and further. Media converters can support multiple types of media from copper to multimode and single-mode fiber. Single-mode converters cover distances up to 80 km with 1310nm optics and even 130 km with 1550 nm optics. Media converters can also enhance the consistency of service. On one side, if there is any problem, the network administrator can troubleshoot one circuit and keep other customers’ connections running. On the contrary, if a fixed port switch goes down, all connections will be down simultaneously when repairing a faulty port. On the other side, customers can used the media converter as an optical demarcation point, which brings cost savings and simplicity. There are many benefits of using media converter in LAN and MAN, such as copper and fiber conversion, speed conversion, cost reduction, simple network troubleshooting and so on. Media converter is not only the optical demarcation between LAN and MAN, but also the bridge between LAN and optical backbone of service provider. With such a cost-effective solution, what’s the reason not to use?